The sonar system was specifically designed for the Inspection of submerged and semi submerged pipelines in that it uses high resolution/short range sonar. Sonar only works under water. 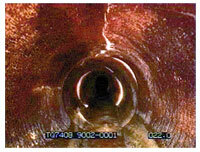 The system itself is capable of Inspecting pipeline from 8” to in excess of 15 feet in size. 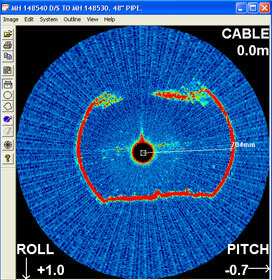 The head of the sonar, its transducer, looks sideways at right angles to the direction of the motion through the pipe, resulting in a cross sectional 360 degree profile of the pipe every second, in “real time”. 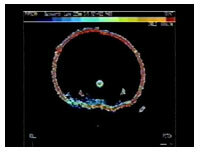 Accurate measurements can be taken from the High Resolution Sonar Images, here showing several inches of debris in the floor of the pipe. 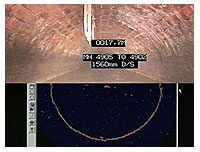 High Resolution Sonar is the only technique available to carry out Inspections where the flow in the pipe cannot be removed nor controlled / restricted. It is effective in fully surcharged or semi-surcharged pipes showing an accurate image of the submerged pipe to identify silt build-up and damage to the pipe wall. The SONAR imaging is taken by a remotely controlled, self-propelled vehicle which also carries a CCTV camera for use in semi-surcharged pipes. Copyright © 2018, Amtec Surveying inc.